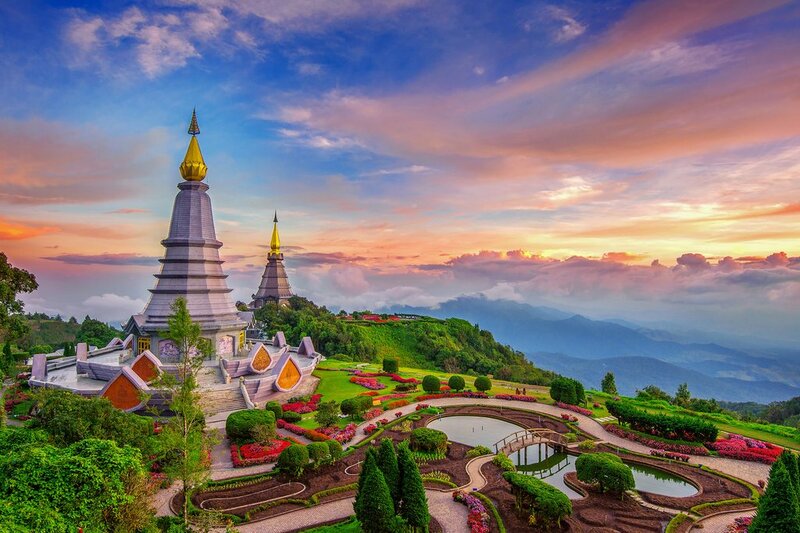 On your first morning in Chiang Mai you'll get out of the hustle and bustle and onto the mountain that overlooks the city, Doi Suthep. 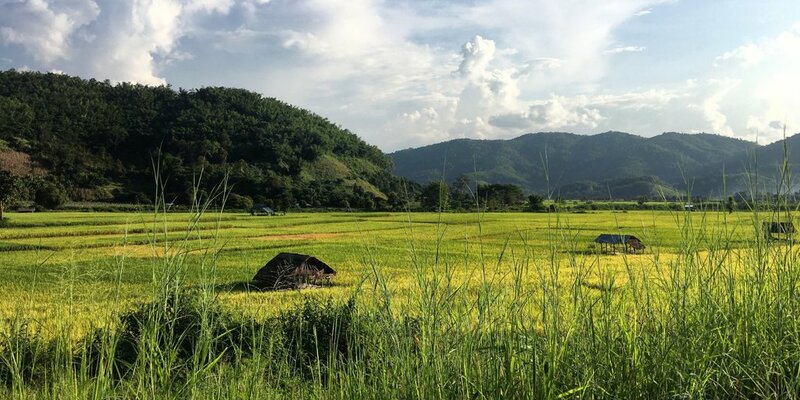 Drive up to the highest peak, called Doi Pui, and then walk along a ridge that will bring you to a Hmong village nestled into the mountainside. Originally from Laos, the Hmong are one of Thailand's hill tribes that reside in the northern mountains. Stop in at a local cafe and taste their locally grown and roasted coffee. 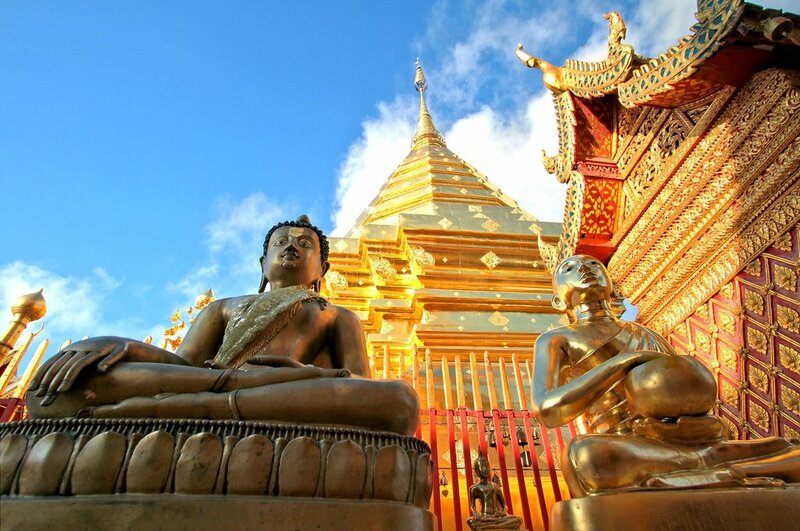 Then hike to the magnificent Wat Doi Suthep, one of Thailand's most sacred temples. Climb the 306 steps to the top to reach a beautiful array of shrines, Buddhas, and gardens. Spend your evening at leisure in Chiang Mai. 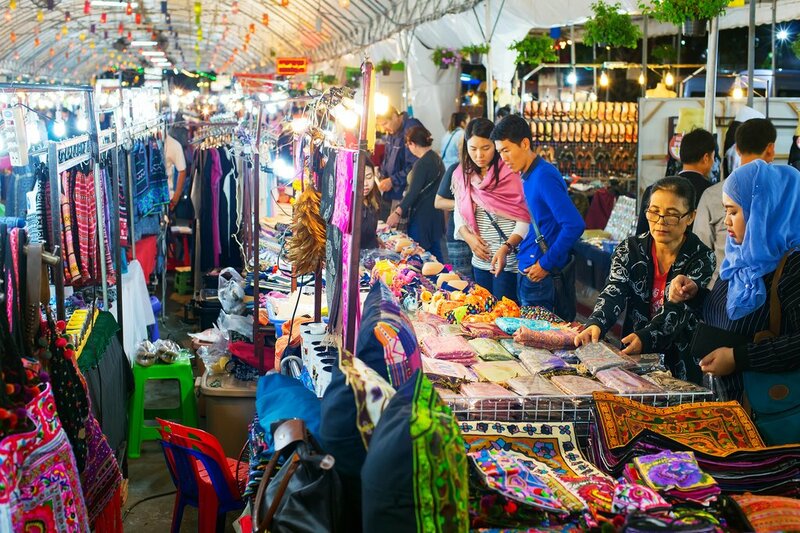 Haggle for souvenirs at the night market, take a walk along the Ping River, or try some of Chiang Mai's delicacies like khao soi, a spicy and tangy curry soup. This morning you'll travel two hours to Mae Ngat Dam in Si Lanna National Park, where you'll find a large reservoir surrounded by mountains. Hop into a kayak and paddle from the dam for about two hours until you reach a collection of floating houses, restaurants, and hang out spots on the water. You'll eat at a floating restaurant for lunch, where you can fill up on Thai favorites like fried rice, spicy salads, and grilled meats. Then relax on the shady deck, or dive right into the water! Sail in a long-tail boat back to the dam in the afternoon. 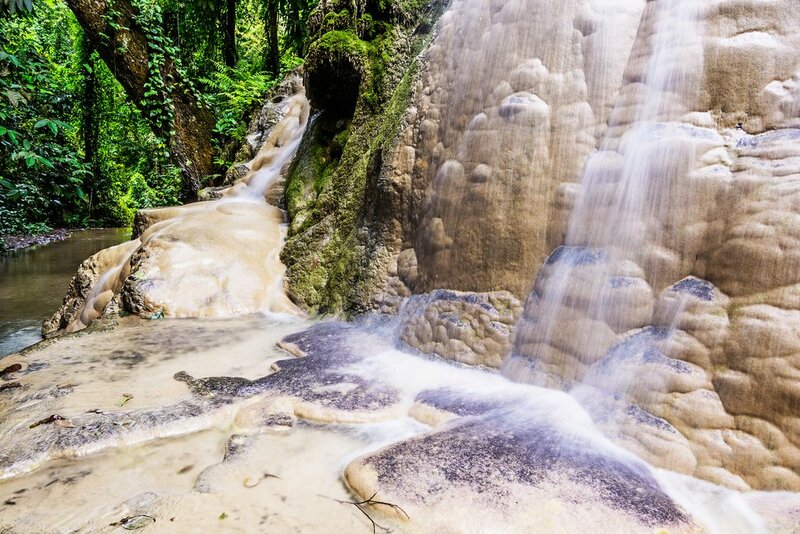 From there you'll take a 30-minute scenic drive along leafy mountain passes to get to the Bua Tong Waterfalls. These curious falls, also known as the "Sticky Waterfalls" are a real treat for the kids. The calcified limestone rocks underneath are porous and feel "sticky" from the streaming water, making them easy to climb. Take off your shoes and join in, or climb the path alongside. 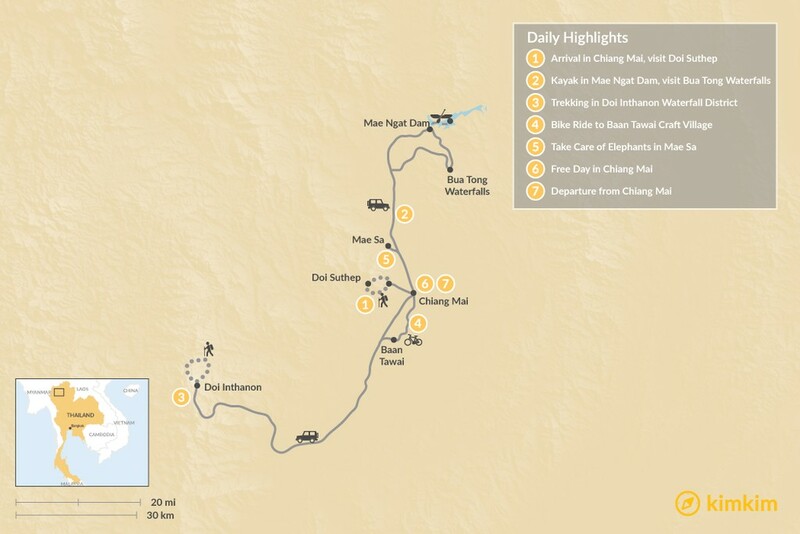 It will be an early start this morning for a one-hour drive to the Mae Wang district west of Chiang Mai. 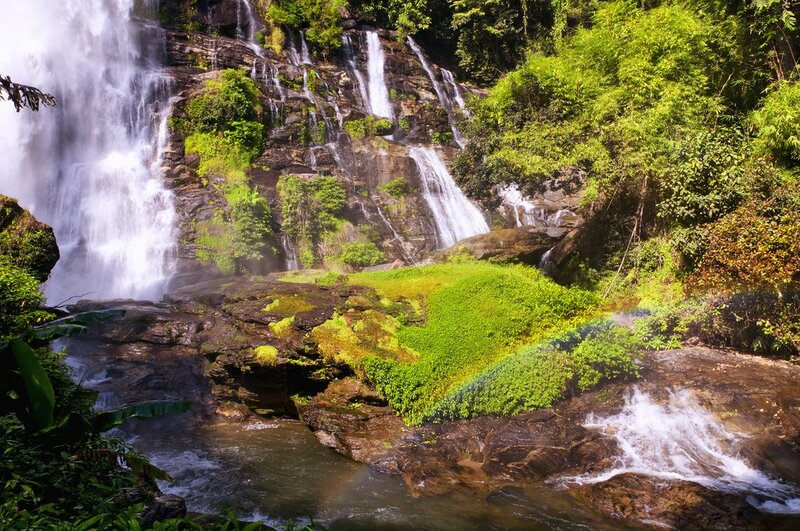 Hike the trail on the north side of Thailand's tallest mountain, Doi Inthanon, downhill for about 40 minutes until you come across the first of the area's many waterfalls. You'll stop here for a nice picnic lunch. Feel free to take a dip in the small waterfall pool, or just cool your feet. From there, continue on through a small Karen village for another hour to reach a second, two-tiered waterfall. 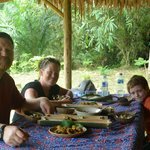 Trek for another two hours through the lush forests with just a few short steep sections to the Karen village of Pha Mon. The Karen people are another one of Thailand's fascinating hill tribes. Learn about their culture and lifestyle, and also enjoy spectacular views of the valley from their village. Then return to Chiang Mai for the evening. After breakfast you'll drive to the outskirts of Chiang Mai, where you'll hop on a bike and ride on backroads along the river and through the rice paddies in the area southwest of the city. You'll stop for lunch before arriving in Baan Tawai, a village known for their handicrafts. Baan Tawai is particularly known for their furniture making and wood carving, and is home to a massive crafts market. Browse the stalls and find authentic souvenirs to bring home with you. Get ready to spend the day with lovable elephants! 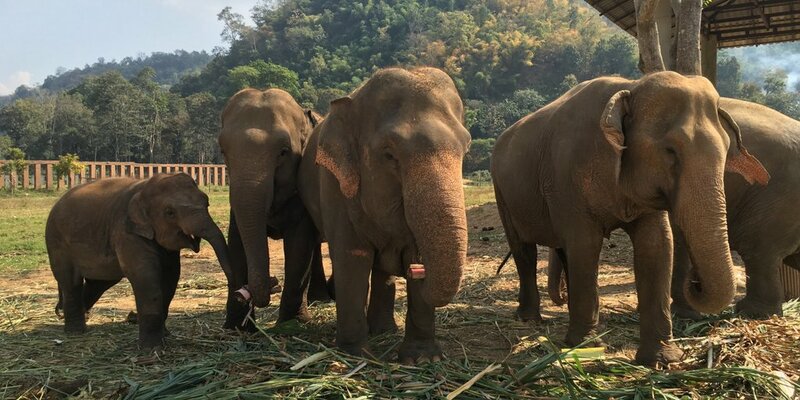 You'll hang out with semi-domesticated elephants in a park in Mae Sa created to protect Thailand's remaining elephant population. This social species native to Thailand were once used in the military and more recently for logging in the teak industry. You'll learn about being a mahout, or elephant trainer, and go for a ride. Practice getting on and off the elephant and how to direct it while riding. Then bathe and feed it as part of its daily care. Spend today on your own in the city. Explore the art galleries on the east side of the Ping River, wander around the markets and sample tasty street food, or visit the Silver Pagoda. Also known as Wat Sri Suphan, this temple is one of the less crowded ones in the area, but is a sight to behold with its intricate silver paneling. 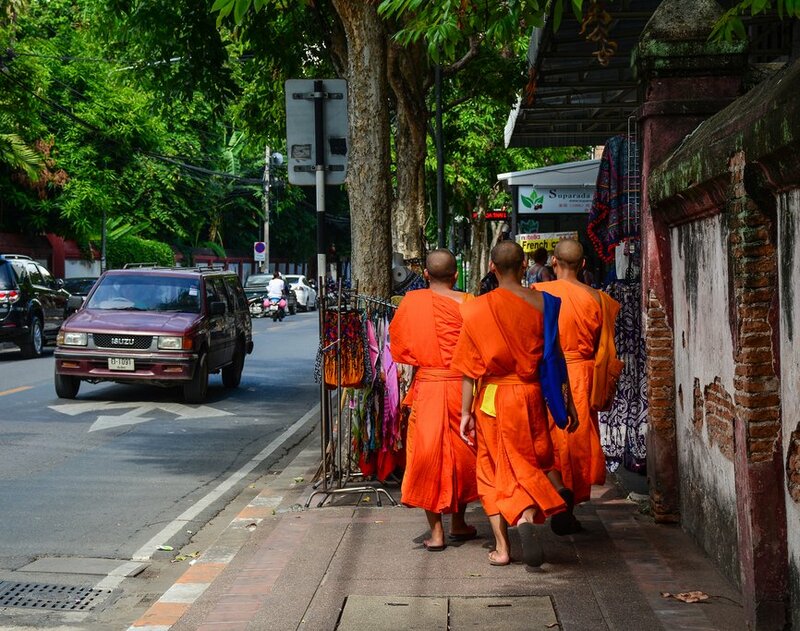 There are also several wats where you can stop in for a "monk chat" and have a conversation with a monk about religion, life, or anything you like while giving them a chance to practice their English. Alternatively, indulge in a spa day and book a Thai massage, or simply relax by the pool. You'll have your last morning free to squeeze in a final delicious breakfast. Then take a taxi (or tuk-tuk!) to the airport for your departure. 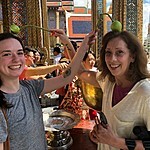 This article is based on an itinerary created by kimkim local travel specialist Holly Richter.